Peter Ronan Rice, the eldest child of James Patrick Rice (1896-1989) and Maureen Katherine Rice (1903-73), grew up in County Louth in the north east corner of the Republic of Ireland. With his brother (Thomas) Maurice (b.1939) and sister Catherine (known as Kitty, b.1942), he was raised a Catholic and lived in the large industrial, market and administrative town of Dundalk on the Castletown River estuary. Rice's parents had married in July 1934 at Dundalk, and he was born in Dublin in a nursing home. 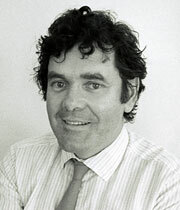 His birth was registered in the district of Dublin South as 16th June 1935. At the time, his parents lived at 11 Faughart Terrace, Dundalk. Five or so years later, the family would move to 52 Castle Road, on the corner of St Brigid's Terrace. Education was important to the family. 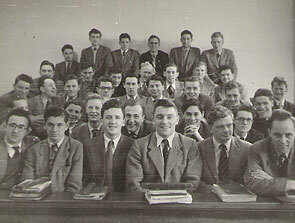 James (Jim) Rice had an influential position as chief technical education officer for the county and, in the early 1920s, he had been selected with 15 other Irish students to attend university in the UK, where he studied at the London School of Economics for two years. Maureen Rice (née Quinn), who had grown up in a large family and was according to Kitty a gentle soul, also attended university. She was the only member of her family with a university education and needed a scholarship to support the endeavour. At the time, only two scholarships were awarded in each county per year, and with one of these she was able to study commerce. It has been said that she was only the second woman in Ireland to attend university, but perhaps it's more likely that she was the second woman to win a County Louth scholarship. Rice senior's time in London had a profound influence on his political views and attitude to the church. A gregarious and chatty man, originally from Kilkenny, it seems he nevertheless kept mostly to himself — his political views were not generally known. Dundalk is close to the Northern Ireland border and during the later period known as 'the troubles', some local people were sympathetic to the cause of the Provisional IRA whose aim was to oust Britain from Northern Ireland. However, according to Maurice and Kitty, none of this was evident during their childhoods. Towards the end of his life, Peter Rice would embark on the writing of a book — effectively an autobiography of his working life — called An Engineer Imagines, which was published postumously. In it he describes the mood of the countryside of his youth and he remembers something more of a local political slant than his siblings. His maternal grandfather, Thomas Joseph Quinn (Dada Quinn, c.1867-1946) was a schoolmaster at St Daigs National School in the village of Inniskeen, which lies 17km west of Dundalk in County Monaghan, only a few miles from the border and the "mysterious" Protestants and Royal Ulster Constabulary beyond. As an eight year-old self-described "dreamer", Rice found Inniskeen claustrophobic, "a permanent heavy shadow covering everything". His great-uncle part-owned the local mill and two farms, which meant fun summer-time activities for boys, such as haymaking — and his great-uncle's two son's were Gaelic football local heroes. Even so, fear seemed to pervade the Inniskeen air and "prying eyes" were everywhere. On one July family visit to the town, a locally-born man who dug ditches was pointed out to him — Patrick Kavanagh (1904-67), already well known as a poet. Much later Rice would realise just how fine a poet. Interestingly, Kavanagh's mother was a Quinn, so perhaps they were related in some way. After 1946, the Rice family spent their summers at Gyles' Quay, a seaside village about 10km east of Dundalk as the crow flies. It was often cool and wet but Rice loved it. He loved the freedom of swimming and was admired for the way he did it. Despite the conformist atmosphere of the Irish countryside at the time, Rice found freedom in roaming and other physical activities, if not the stimulus to think. In Dundalk, he attended a tough Christian Brothers school with Maurice, where lessons were taught in Gaelic and strict discipline instilled with a leather strap to the hand. He was often singled out, and picked on by older boys. Maurice believes this was largely related to troubles with the family that lived next door to them. From an early age, it was numbers that interested Rice. In this he found an ally in his elderly maternal grandfather, who tested him on mental arithmetic and seemed to understand that he was happy with numbers (and gooseberries) not words. "I knew I loved numbers. They all seemed different, with their own special quality ... with numbers I could play all day in my mind. Not like words, which flowed endlessly overhead." Rice didn't learn to read until he was about nine or ten, and had an erratic school record. Kitty feels that today he may have been diagnosed as dyslexic. Numbers represented another kind of freedom for him, along with his imagination. Looking back, he observed the insularity of his upbringing, where world events seemed far away and social values and religion dominated intellectual life. He claims to have been a kind of "compulsive non-joiner", avoiding any sort of club, the cadets and the boy scouts. However, between the ages of about 10 and 14, he did serve as an altar boy and thought about becoming a priest. When he was fifteen, to show him that the priesthood wasn't right for him, his father sent him to Newbridge College, a boarding school in County Kildare run by Dominican Fathers. Rice thought the educational standard there poor but it did change his mind about being a priest. Jim Rice's position as chief education officer made him head of techncial (vocational) education in the county, and he reasoned that as his son was good at maths, engineering would be a sound and suitable career. He advised Rice to enrol at Queen's University in Belfast, Northern Ireland, as it had the best courses. Rice met the university's entrance requirements in October 1952. At first he studied aeronautical engineering but switched to civil engineering because, "I could not stand the place where it was taught". He started to come out of his shell at Queen's — former colleague describes him as an extrovert, a bit hyperactive and always waving his arms about, very bright and very popular. "You could see his mind was working faster than most peoples'." 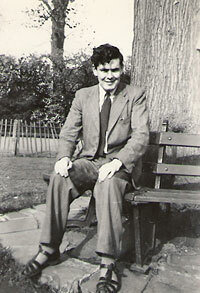 Rice graduated from Queen's with a 2:1 on 10th July 1956. He joined Ove Arup & Partners in London that year, beginning an association that would last his entire career. Exciting prospects to come. But before they began in earnest, he continued his education by enrolling at Imperial College, London, for the 1957-8 academic year. In moving to London and joining Arups, Rice certainly lands on his feet. Not only does he find a working environment in which he gets the chance to use his mathematical ability but he also gets to work on one of the seminal projects of the 20th century, straight out of college. Photo taken on the afternoon of Rice's graduation from Queen's University, Belfast, by fellow graduate Hall Maxwell. He had enrolled in aeronautical engineering but quickly switched to civil engineering, where he studied structures. taken by lecturer Paul Scarlett, a survivor of the 1953 Nutts Corner Airport air crash. Peter Rice is on the right hand end of the second-last row.